Wanna go hiking? Better bring a jacket! Look at the snow being blown off the back of the mountains. On the left is Mt Bradley, and the Center Basin Crags are in the center. 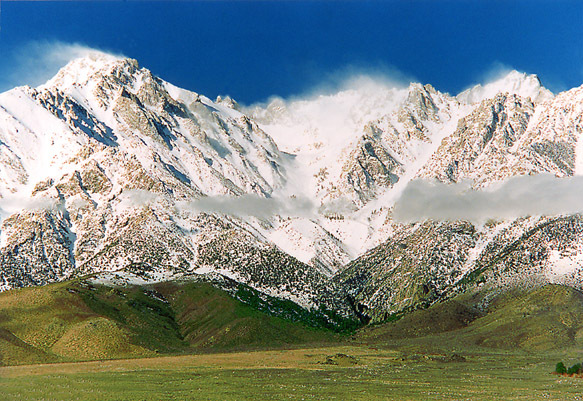 They are part of the Sierra Crest, standing almost two miles higher than the Owen's Valley floor. Pinyon Creek canyon cuts down the center. On the far right can be seen the top of University Peak, sticking up from behind the front ridge. Quite a difference some elevation makes.